PE and school sports are a focal point that can be used to define our school’s culture and they are paramount in developing and reinforcing our school’s ethos-instilling our pupils with MAGIC Habits! Our pupils are engaged in a rich, broad and balanced curriculum and a wide range of extracurricular PE and sports programme which provides them with ample opportunities to challenge themselves within the school and against their peers in other primary schools. As from the start of 2017/18 academic year, our school was awarded The Gold Sports Mark, gold being the highest accolade for primary schools. This is an acknowledgment and celebration of our PE and sports provision. Below are highlights of what our pupils have recently achieved. close final. What a wonderful achievement all around considering the amazing talent on show. 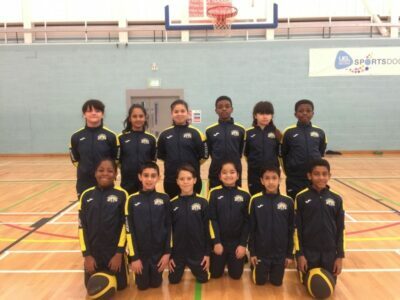 Our KS2 pupils did a wonderful job reaching the Newham finals of the Sports Hall Athletics competition, which brought together the most gifted and talented children in Newham. A group of more able pupils took part in a very competitive KS1 athletics competition. For this cohort, it was their first competitive event. They did themselves and the school extremely proud, bringing home the 1st place trophy and a lovely set medals around their necks. A selection of pupils from years 3 & 4 went to Rokeby School and took part in a 16 team dodgeball competion for lower KS2 pupils. Keir Hardie ending up winning ALL of their games and went home the overall winners. Children in years 5 & 6 went to Rokeby School and took part in the Cumberland SSP Table Tennis competition. The children really enjoyed their experience and have now developed an ongoing passion for Table Tennis. At the start of the academic year, our pupils entered a cross country competition hosted by the Cumberland Sports Partnership at West Ham Park. Two of our amazing pupils came 1st place, with another coming 2nd. Wonderful achievement all around! To celebrate Keir Hardie School Sports Week, we’ve had a host of amazing activities running in and out of the school. As a brief summary, our upper KS2 children experienced paddling and sailing at the Royal Docks Adventure site, Y3, 4 &5 went to the Olympic Park and completed the Go Run For Fun Mile, and all our children KS1 pupils became better skippers, as well as experiencing rowing in school through our own rowing machines which we hired for the entire week! Another wonderful occasion where families, staff and pupils celebrated sports together! The pupils represented their Houses and the families represented their children, culminating in a joyous experience all round. Thank you to all EYFS pupils, their families and staff members associated with EYFS​. Our SEND pupils throughout the key stages had the opportunity to take part in competitive sports and games run by Panathlon and Cumberland SSP. Unfortunately they did not qualify to the London finals like last year, but our children really enjoyed the experience. 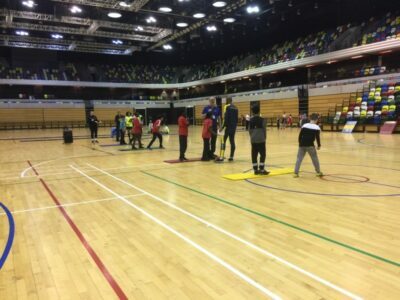 Pupils in lower and upper key stage 2 went to the Olympic Park in Stratford and competed in an orienteering competition against numerous schools in Newham. With what was a first for many, it was an excellent achievement for our children to come home with a medal as the school with the 3rd fastest time. Rarely do we have competitions on the weekends, but our lucky Y5&6 netball team were chosen to take part in a competition at the Copper Box Arena as a warm up to a televised netball match featuring some of the best netball players in the world. Our talented Y2 pupils went to Vicarage Primary School who hosted the KS1 Athletics competition. Children competed in sprints, long distance runs as well as jumping and throwing events. Unfortunately our pupils did not medal, but hopefully they will use this as motivation and as a stepping stone for future success. What an achievement, as both our Y3&4 and Y5&6 gymnastic squads finished in third place within their age categories, whilst one of our Y4 girls, came second in the individual events. We are expecting big things in the future from our gymnastic squads! It is wonderful how children in years 4 and 5 have taken to cricket! We look forward to further continuing upon the enthusiasm displayed by our cricketers who have shown courage and resilience despite coming across historically good primary school teams at the recent Newham Cricket competition. Our Sports Leaders were given an opportunity to independently plan and deliver a multi-sports competition with the help of Derek, our Cumberland School Sports partner. Our young leaders delivered an extremely successful event for pupils in years 1,2 & 3. 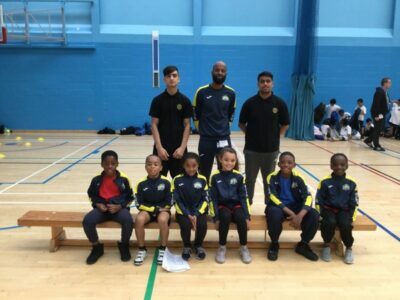 At the end of the Spring term, our basketball team attended UEL’s world famous SportsDock for a competition run by the Cumberland School Sports Partnership. In a highly competitive field, our pupils came 2nd in the competition, with almost everyone in our team being invited to a talented and gifted session run by local basketball club, NASSA. ​​On Friday 23rd March our Keir Hardie Tornadoes went to the termly Cheerleading Showcase at the ExCel London. We are very proud of them as they came back with GOLD!!! 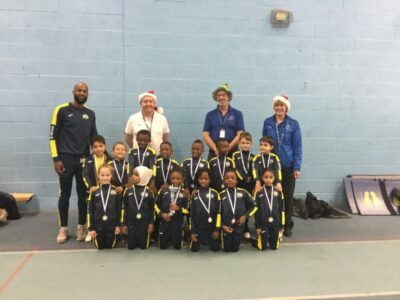 What an amazing start to the new term and calendar year as pupils from KS2 competed in an indoor athletics competition in which they qualified for the Newham finals. Congratulations all round and good luck for all those competing in the finals. For what was for many, a first experience playing in a competitive handball competition; Keir Hardie done extremely well to reach the finals and to only lose by a one goal margin. Great effort all round and we hope our talented UKS2 pupils keep piling up the medals. Our amazing pupils performed superbly at a recent Cumberland SSP Competiton held at Cumberland Secondary School. Keir Hardie ended the competition finish in 2nd place. Congratulations to all involved. Our lucky year 5s were fortunate enough to experience the wonderful outdoor ice rink at Somerset House. With this being a first time experience on the ice for many of the children, we are sure it will live long in their memories. 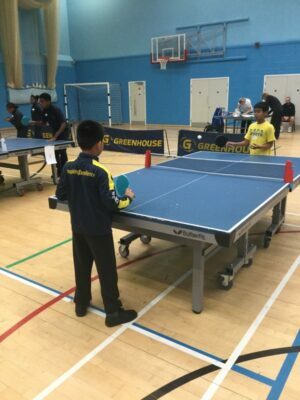 Children from years 5 & 6 competed at the Cumberland SSP Table Tennis event delivered with the support of Rokeby Secondary School Sports Leaders. Keir Hardie done really well in a competitive field to finish in 3rd place. Well done to all those involved! A total of 40 pupils from across 4 year groups competed at the Cross Country competition delivered by Cumberland School at West Ham Park. The highlight performance was from young Hasnan in year 4 who finished 2nd in his category! Congratulations to our wonderful runners who worked really hard.